Hello, we are the preschool children at The College Nursery. We live in a city in England called Peterborough. There are 41 children in our class all aged between 3-4 years old. At the moment we are learning about Africa and all of the different animals you have there. 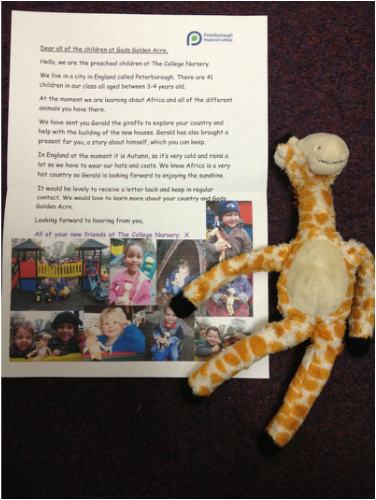 We have sent you Gerald the giraffe to explore your country and help with the building of the new houses. Gerald has also brought a present for you, a story about himself, which you can keep. In England at the moment it is Autumn, so it’s very cold and rains a lot so we have to wear our hats and coats. We know Africa is a very hot country so Gerald is looking forward to enjoying the sunshine. It would be lovely to receive a letter back and keep in regular contact. We would love to learn more about your country and Gods Golden Acre.